Sparky's Answers - How To Search Sparky's Answers; Old School, New School or No School? No matter which category you fit into Sparky’s Answers has a search option for you. Try all three methods. You might find out that you are not who you think you are. Old School fits me because well, I am old. I grew up in this industry and this world using a table of contents or an index to find the information I needed within printed material. Give me a list of what is in the book and let me decide what is important to me. 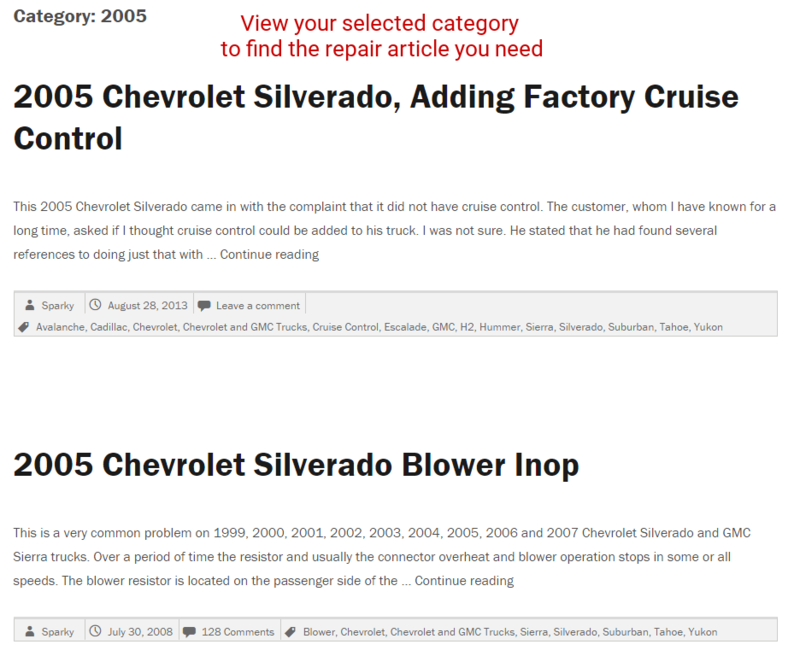 With that mindset, I prefer to use the “Repair Article Index” as my first option for looking for a particular article within this site. There are a pros and cons to this method though. It displays and works well on all devices however my older eyes prefer viewing it on the larger screens. For better results you should know what you are looking for and how it relates to the index list. For example, the auto blower system on a 2003 Silverado is exactly the same as the auto blower system on a 2004 Sierra, 2005 Avalanche, 2006 Escalade and so on. I know this, so I only have to look under Full Sized GM Trucks & SUV’s, Front HVAC, Blower Issues and Auto Controls. Once there I have access to every article related to that topic regardless of the model, year or problem. This is both a good and bad thing. If you are well informed about shared components/technologies within a manufacturing group then you will be able to use the repair article information across various brands. This is also good if you are just generally curious. The bad part is if you do not have the above background knowledge or experience you might easily overlook relevant information about your vehicle’s problems. New School uses the “Find An Answer” drop down search menu. Simply enter the “Year”, “Make”, and “Model” and let the system find the articles related to that vehicle for you. The drawback to this method is that you may not realize that there may be multiple repair articles that you would like to read, but the system did not recognize them because of the search parameters you entered. Over the next year this system will be refined to include related articles about similar vehicles and more levels of search will be added. It does work really well on a smart phone though. What I refer to as No School is the “Search Bar” found at the lower edge of the “Find An Answer” section. If you are relatively new to automotive repair or just have not had any luck using the other two methods start entering keywords to search for your answer. The shorter the keyword phrase or list is the more likely you are to receive a result. There is no perfect solution so for the time being Sparky’s Answers offers these three methods for searching for repair article information.